Make quick work of post hole digging. 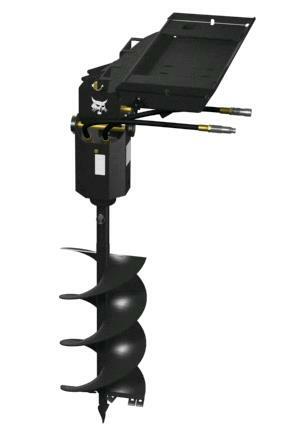 The auger attachment is required to use auger bits. It connects to the machine, the auger bits and extension connect to the auger attachment. The auger attachment rental rates are $52.50, $78.75, $105.00 and $420.00 for 4,8, 24 hour and one week rental respectively. This is in addition to the machine and bit rate. The Vibratory Plow is used with the Mini Loader and is used when laying underground cables or irrigation systems. * Please call us with any questions you may have about our bobcat digging attachments rentals in Petoskey, Northern Michigan & The Upper Peninsula.